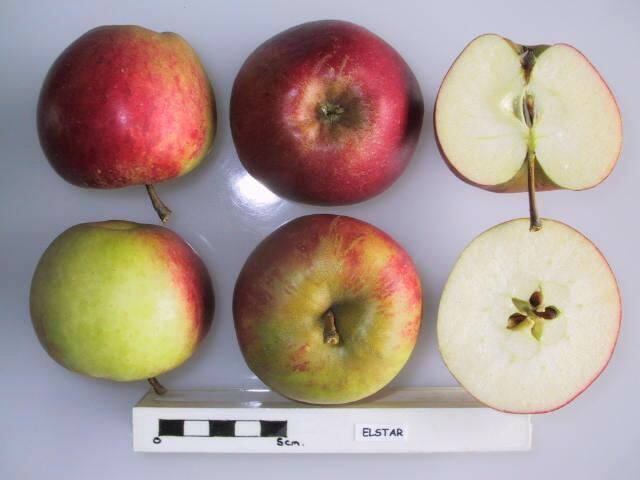 Elstar is another successful offspring of Golden Delicious, developed in the Netherlands in the 1950s. 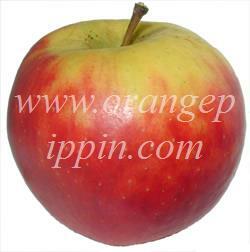 It is a popular easy-eating dessert apple, widely grown in Europe but less well-known in the UK or North America. There are a number of commercial sports, including Elista and Valstar. Elstar has a distinctive appearance - difficult to describe but quite apparent once you have seen it. The skin is marbled, often with a soft sheen to it. It also lacks the perfect smoothness of many modern varieties. The underlying colour is golden yellow but overlaid with deep red. There is also a "sport" known as Red Elstar, where the red colour usually covers the entire surface with only the occasional peep of yellow. The flavour can be more intense than is often the case with other Golden Delicious offspring. It retains the appealing sweetness - usually described as 'honeyed' in most apple text books - but with a good balance of acidity. Elstar is definitely a crunchy apple, but not as crisp or hard as some - definitely the softer side of crunchy. The flesh is lemon-white. In most Golden Delicious offspring it is the other parent which provides the essential counter-balance to offset the sweet blandness of Golden Delicious. In the case of Elstar this is Ingrid Marie, a variety which originates from Denmark. Although not a widely-known apple, it lends a bit of oomph to the mix - inherited from its own parent, Cox's Orange Pippin. The result is Elstar, which is probably one of the best Golden Delicious offspring. Visitor comment: "We ate one just after a Russet and noticed how much sweeter and jucier it was (although the Russet will always be one of my favourite apples), a bit like drinking a glass of apple juice, a hint of pear about it too." Rebecca, East Sussex. about 15 years ago i ate an elstar apple and its one of those times in my life that sticks in my head. i thought it was the best apple ive ever eaten. never able to find another, or tree to plant. These are the best pie apples ever. I agree with Jordan. I tried a couple of trees of this variety. I found the apples to be rather bland, insipid and lacking in character. I grafted them over with better varieties - Adam's Pearmain and Sunset. Compared to some of the apples out there, the taste of this apple - at least the one I tasted - is very much mediocre. Very juicy. Sweet compared to older eating apples, but not compared to something like Royal Gala or Discovery. Discovery itself isn't the deepest taste, but even compared to discovery the taste of Elstar is poor as a dessert apple. Noticed a russet-like taste, changing towards the end of eating the apple into a more pear like flavour. Would be much nicer just to eat a pear; even though I tend to prefer apples to pears. Certainly wouldn't plant it as a dessert apple. I envisage that it would make a good juice, but perhaps blended with a stronger tasting apple to give it some depth, which Elstar lacks. Main advantage would be for bulking up - if tree has gold yields. I bought one of these trees for my garden and it's budding at the moment. I searched in the shops for the variety and bought some and found that they taste very nice, they're a bit like a better Cox's (many of those from the supermarkets are somewhat bland). Excellent flavor both fresh and cooked. Seems to store quite well - the apples picked four months ago are still firm and sweet, and good eating. If I could have only one apple tree, this would be my first choice. Just bought one of these today in a pot. It has about 30 little fruits on it. A good start. I chose this variety as label says..Good pollinator...I have a 'self pollinator' which seems to need a mate. We'll see what happens. I agree with Niamh, - a brilliant apple, & grows easily here in Ireland. I bought one of these for my mom about 5-6 years ago from Trees of Antiquity in CA. It bore very well this year in Zone 5 - rural IL - and we love the sweetness of the apples. So much better than anything you can buy in the store. If you're looking for a great apple, Trees of Antiquity still stock them and I've had very good experience with the quality of their products, delivery, etc. I love this variety. They are so hardy, they can be grown in Ireland organically. That's no mean feat with our weather. Ireland and Holland are the main suppliers of this variety. I love this elstar apples. I regularly ate this apple. They are delicious, especially straight out of the fridge. It is true, they have the perfect balance of sweetness and acidity and a lovely flavour and crispness. I was introduced to the Elstar several years ago at a small orchard on Greenbluff in Washington state. It is now my favorite apple for eating and cooking. Sainsburys have Elstar on their basics range currently, and what a superb apple to discover at such a low price! Tastes of Honey, Sherbet Fizz, Crunch, Sharpness - in a very nice overall balance. This apple seems to do well in our damp West country air. Our young tree has cropped well with large crisp juicy fruit. Delicious. I saw these apples for the first time last week and they were so cheap I only bought a few, thinking they wouldn't be very good. How wrong I was. They are delicious, especially straight out of the fridge. They have the perfect balance of sweetness and acidity and a lovely flavour and crispness. Just tasted the first fruit from my own tree (amongst others such as cox, egremont russet..) and delighted to say it was a wonderful surprise - the appearance is delightful with blemish-free regular shaped fruit, good for exhibition. The flavour is tangy, juicy and sweet. The tree seems a heavy cropper from an as yet small size. I regularly ate this apple while living in Cologne, Germany. It was a favorite of mine and I am searching for a supplier in the US for a tree. Just purchased an Elstar apple on coronet miniature rootstock, and fully agree with your comments. Ive tasted and enjoyed Ingred Marie and Golden Delicious and now Ive the best of both on one tree.